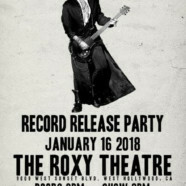 JOE PERRY–legendary guitarist, co-founding member, principal songwriter and co-producer of Aerosmith–will perform a special record release show Tuesday, January 16 at The Roxy Theatre inLos Angeles, CA. Taking place three days before the January 19release of his forthcoming solo album SWEETZERLAND MANIFESTO, this “Joe Perry and Friends” gig will encompass material from the new album, Aerosmith songs and PERRY hand-picked covers. Tickets for the show go on sale Friday, December 15 at 10: 00 AM (PT) at www.ticketfly.com.